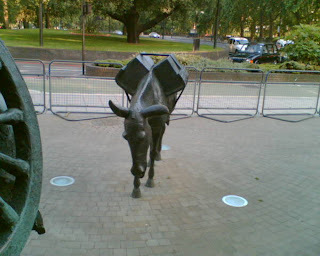 Tory Historian was proceeding along Park Lane in a northerly direction and decided to cross over to have another look at the Animals in War memorial. It is, one must say, rather moving. 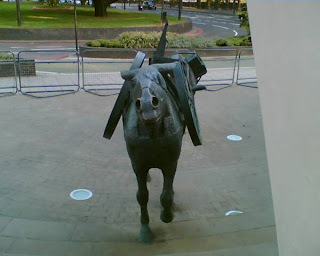 Here are two pictures from it, both of the pack horses, looking sad and long-suffering. Tory Historian cannot let this day pass without mentioning the one event of modern history that can be described as catastrophic in every way: the assassination of Archduke Franz Ferdinand by the Bosnian Serb nationalist, Gavrilo Princip, backed by six co-conspirators. That shot fired in Sarajevo has been rather dramatically described as the one that ushered in the “real” twentieth century. Certainly its outcome – the two groupings of allies going to war not only plunged Europe and, through the various empires and America’s eventual participation, the world into a horrific war but created the darkest and most savage decades of European history for many centuries. By 1918 Germany had lost her empire and was a defeated and humiliated country; Russia was in ruins and the Ottoman Empire in pieces. Europe went on living out the consequences for the rest of the century, the Middle East is still doing it. By an interesting coincidence, June 28 is also the day in 1919 when the next step in the twentieth century tragedy was taken – the Versailles Treaty was signed, leaving Germany with a feeling of bitterness and France with continued dissatisfaction. What do we know and what can we prove? 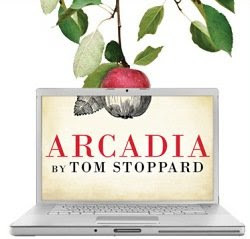 Seeing Tom Stoppard’s “Arcadia” in its first revival since 1993 sent Tory Historian into a frenzy of musing about research, evidence and the obvious difficulty all historians face of how much of what we know we actually do know and how much of it we can prove. As just about everyone knows the play shows events taking place in the same stately home in Derbyshire at the beginning of the nineteenth century and the end of the twentieth or, in this production, the beginning of the twenty-first, the latter centred on an investigation of what happened in the former. Because we can see what “really” happened in the earlier part we can see where the later researchers, literary historians and a scientific mathematician, may be going wrong and when they begin to see the “truth”. Assuming, of course that it is the truth, something the play leaves, if not in dark, at least in crepuscular dusk. Interestingly enough, it is the professional, Bernard Nightingale, who proceeds largely on his intuition that sometimes proves to be right and sometimes wrong; Hannah Jarvis, the amateur, demands a stricter standard of proof in which she is at one with the scientist Valentine, a descendant of the family we see in the earlier segments. As we watch the two literary historians spar we realize that, as it happens, neither of them is a particularly good researcher. They seem to have little idea of where one can find information to support their assumptions apart from the accidentally preserved letter. Does an historian of literary life in the early nineteenth century really not bother to find out who edited the various London magazines? On the other hand, as R. G. Collingwood has pointed out, among others, one cannot research without having some idea of what one is looking for, even if the subsequent research proves that idea wrong partly or in whole. Sometimes the idea appears as happenstance. Bernard’s feeling that Byron must have stayed in Sidley Park is vindicated by Valentine mentioning that the poet is listed as a guest who shot in the game book, a valuable document that neither Bernard nor Hannah are aware of. As it happens, even the game book can be inaccurate and this we know from our view of what “really” happened in the years 1809 – 1812 in Sidley Park. The point is that the entry Hannah finds would have had little significance if Bernard had not, some time previously, found several letters in a book that, at some point, belonged to Byron and drawn several entirely wrong inferences from them, which sent him scurrying to Sidley Park where she was researching the existence of a possible hermit in the artificial hermitage in the first half of the nineteenth century. Confused? Well, that’s research for you. Tory Historian had yet another argument about Whigs recently, when buying a second-hand copy of Ophelia Field's "The Kit-Cat Club" in a well known and highly regarde West London bookshop. The owner of the bookshop, a somewhat leftish minded lady, seemed to be convinced that the Whigs were the forerunners of all liberal and democratic thinkers, not merely a group of families and individuals who managed to wrest power away from the Crown and tried to ensure that it stayed with them. Could this be a hang-over from the old Whig tradition of history or a somewhat more up-to-date misreading, based on that Duchess? On the other hand, a reading of the Prologue (titter ye not! ), which deals with Dryden's second, very grand, funeral, organized by the Kit-Cat Club, made Tory Historian smile. Though both Whigs and Tories attended the funeral, no public occasion could take place in the 1700s without one of these two political parties attempting to dominate it, and in this case the Tories resentfully acknowledged that the Kit-Cats were posthumously appropriating Dryden to their distinctively Whig narrative of English literature. It is, however, unlikely that the Kit-Cats would have understood that expression "narrative" in this context. The Germans invade the Soviet Union across the borders created in 1939 - in reality, eastern Poland and the Baltic States. 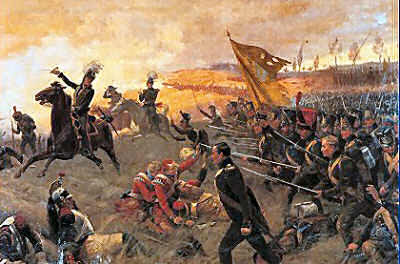 As every school child should know yesterday was Waterloo Day. Tory Historian decided on a picture and a map. Well, how can you discuss or even think about a battle without a map? As to why a day late? Tory Historian has a reasonable excuse - the technology, clearly on the liberal side, proved to be recalcitrant. Admission is free, and includes a glass of port for everyone in the audience. In 1922, Winston Churchill had been a popular MP for Dundee for the last 14 years – he had one of the safest seats in the country. But at the general election, he unexpectedly lost his seat by a landslide, to a pacifist, and an independent prohibitionist candidate. Why? What did this signify about the changes in British politics? Did Churchill ever really understand the cause of his defeat? Seth Thévoz will for the first time present some groundbreaking research on this fascinating chapter of Churchill’s life, and Scotland’s political history. Expect a heady combination of temperance reform, militant trade unionism, angry journalism, disgruntled war veterans, and crisis-ridden political parties! Was Castlereagh mad and if so why? The reason Tory Historian was cogitating about this was a book by Giles Hunt, entitled “The Duel – Castlereagh, Canning and Deadly Cabinet Rivalry”. It is rather an odd book in that it follows the career of the two politicians with the focus on their long enmity, which finally resulted in the infamous duel of 1809 that left Canning with a flesh wound (though it could have been very serious, Mr Hunt keeps reminding us) and the reputation of both ministers as well as that of the government in tatters. Yet, despite the fact that the duel is at the heart of the book, Mr Hunt professes not to understand what happened in the nine days before Castlereagh actually challenged Canning (that is how long he waited after realizing that the latter had led a behind-the-scenes intrigue against him) and during the actual duel. The simmering anger behind Castlereagh’s challenge reveals his pent-up feelings, and there is no mystery as to why he challenged Canning to a duel. He felt humiliated and angry, and Canning was the man who had been insisting that the government needed to be changed. The mystery is the delay in issuing his challenge, with a subsidiary mystery about the way he aimed, or failed to aim, his two shots. It is strange. So, it would seem that Castlereagh was very angry about Canning’s machinations but we do not know why it took him nine days to issue a challenge and why he missed Canning (probably deliberately) with his first shot and wounded him with his second. Strange, indeed. Particularly as this is at the heart of the book. In the end, Mr Hunt settles for Castlereagh being psychologically unstable, probably mad and suffering from tertiary syphilis. His evidence for his psychological problems at the time of the duel is an analysis by a graphologist, who had died before the book was published, made on the basis of a photocopy of a letter written by Castlereagh. Even if the graphologist was given the photocopy blind, so to speak, this is doubtful evidence. Apart from that there is a great deal of “must have thought”, “would have assumed” and “probably felt” in the crucial chapters. Tory Historian had a rather old-fashioned training in history writing that definitely precluded phrases of that kind. As for the tertiary syphilis or “some form of syphilis”, that is based on various snippets about Castlereagh’s health throughout his life as well as the final catastrophe of the morning when he cut his throat. Yet another expert is called in, a senior consultant neurosurgeon, also deceased before the book’s publication, who produced a diagnosis on the basis of H. Montgomery Hyde’s book, “The Strange Death of Lord Castlereagh” that contained most of the report of the coroner’s inquest. None of which really solves the problem. Tory Historian was caught up in the excitement (well, a slight frisson) that surrounded the European elections, which, in fact, will change very little. It is time to return to books that matter. On the list are two very different volumes. "Private Views - Voices from the Front Line of British Culture", put together by Peter Whittle, director of The New Culture Forum and published jointly by NCF and the Social Affairs Unit, is not precisely historical except in its background, but an analysis of the state of British culture (a suspect term, admittedly) and the need to wrest control away from the left-wing arts establishment. A more obvious choice is Andrew Roberts's "Masters and Commanders", which is packed with wonderful stories about four extraordinary people, two politicians and two military leaders. Time for me to issue a call for articles for the Conservative History Journal or, if people prefer to go about it that way, ideas for articles. Get in touch either through this blog or the e-mail in the Journal. I am looking for articles or reviews on any subject that might be characterized as having to do with the Conservative Party, its members, MPs, writers and ideologues and the conservative movement as a whole in Britain and other countries. That is a very wide remit. The lighter one is “The Raj at Table” by David Burton, a professional cookery writer from New Zealand, who became interested not just in Indian food but in the whole concept of the food of the British Raj and the social habits that grew up around it. The introductory history tends to be a little on the accepted and predictable trendy side – all that stuff about the White Man’s Burden, a phrase Kipling coined in very special circumstances: he addressed the poem to the Americans in 1899 after the Spanish-American War when the Philippines were taken. Like the better known Recessional, written for Queen Victoria’s Jubilee, the poem is not precisely a hymn to imperialism but an acceptance of duty and a warning against arrogance. One may or may not agree with Kipling sentiments but using that phrase, like “dominion over palm and pine”, in an inappropriate throw-away line is wrong and dishonest. Mr Burton is not an historian but a food writer. For all of that he is full of every prejudice against Victorians that the world of glamour media supplies, often disproving his statements by his own accounts and quotations. For instance, he maintains that the “memsahibs” (a word he is inordinately fond of) managed to remove Indian cuisine from British tables, imposing their own view of what food should be, that is either British and heavy or French and inappropriate. Yet, every menu, every description of every meal, breakfast, lunch (tiffin) and even dinner seem to include curries and pilavs. They had not all gone. Tory Historian suspects that the homes of the numerous traders and businessmen as well as lower rank officials that do not figure in Mr Burton’s accounts had a greater preponderance of Indian food than the Viceroy’s or various Governor-General’s formal dinners. Another crime the Victorians were apparently guilty of is contempt for all things Indian (Mr Burton clearly does not know about Lord Curzon’s hard work to preserve Indian memorials and architectural works of art) and disregard for Indian notions. Yet he also tells us that “[i]n certain parts of India it was not permitted to eat pea-fowl, however, out of respect for Hindus, who consider the bird sacred”. Furthermore, it seems that British officers would attend important Hindu and Muslim festivals throughout the year as a mark of respect, as well as invite various high-ranking Indians to Christmas parties. So, errm, what is the truth about that lack of respect? Some and some, as usual? Or, maybe people who attempt to write on any aspect of cultural history should learn more about their subject (including the timing of when service à la Russe, that is course following a course in the now accepted fashion, became the norm in Britain). Given all that, why does Tory Historian think that this is a pleasant book to read? Because when David Burton manages to overcome his prejudices he produces a delightful set of stories about what the British ate in India. It cannot really be called a history because he hops around so much, demonstrating a story from the early twentieth century by providing an anecdote or a description from the early nineteenth. A number of his quotations had Tory Historian reaching for library catalogues for further reading. Above all, there are the recipes. How can one resist dishes that are called: Pineapple Beef, Jahl Fry, Sandhurst Curry (one to try on one’s enemies), Navroji Framji’s Mahratha-Mode Meat Curry or desserts such as Pootoo Rice Fritters? Tory Historian intends to try one or two and describe recipes and results. The other book is a more scholarly one: “Coffee and Coffeehouses” by Ralph S. Hattox. Professor Hattox, who appears to be an expert on the history of coffee, an excellent thing to be in Tory Historian’s opinion, “The Origin of a Social Beverage in the Mediaeval Near East”. He writes of the early history of coffee, its use in Sufi rituals, the general growth of its consumption and the importance of coffeehouses as social and cultural centres. The early part of the book is taken up with the ferocious debates and fights around the introduction of coffee, the furious attacks on it and the rituals around it by Islamic scholars and the equally furious defence by other scholars and people who liked coffee. This proves that in the Near East, just as later in Europe, coffee had and has a magical quality, good or bad. Coffeehouses were always dangerous places as far as the authorities were concerned; the drinking of coffee was often perceived as something akin to black magic (and that is not counting the fortune telling that revolves round coffee sediment). On the evidence of the first two chapters Professor Hattox’s book, based on Arab and European sources will impart much of interest. Plus there are delightful illustrations of coffee makers, coffee drinkers and coffeehouses.